With less than a month to go before the Olympic Games open, flight bookings to Rio are booming, according to ForwardKeys, which monitors future travel patterns by analyzing 14 million reservation transactions each day. The peak arrival date for Olympic fans is August 4, the day before the opening ceremony, but a significant number of visitors will start to arrive earlier, from July 27. 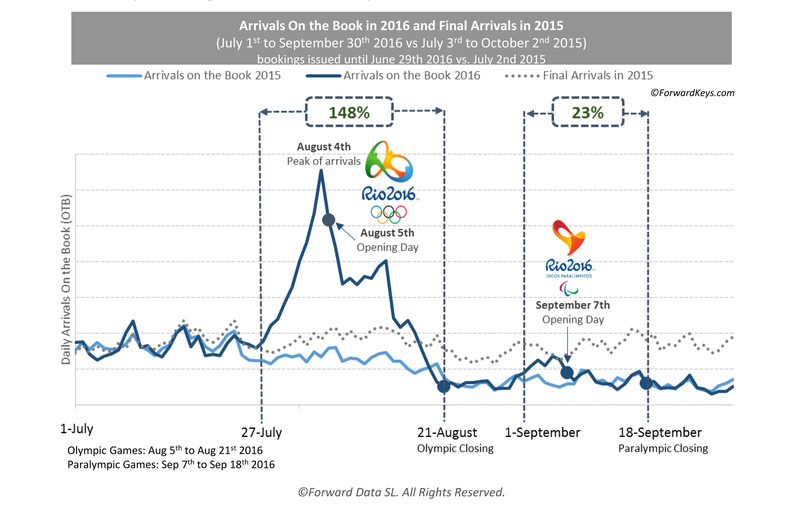 When compared with the same dates last year, forward flight bookings are ahead 148% between July 27 to the Olympic closing day on August 21. Flight bookings for the Paralympics, which run from September 1-18, are up 23%. In all, 14 countries account for 72% of advance flight bookings to Rio during the Olympic and Paralympic period, headed by the US with 18%, followed by Argentina with 13% and the UK and Germany each with 7%. The high volumes from the US may be helped by a relaxation of visa conditions for the duration of the Games, making it easier for American sports fans to travel to Rio. Forward bookings show 24% of travelers are staying for 9-13 nights and 23% for 6-8 nights, between July 27 and September 18. For those visitors staying 22 or more nights, 70% will arrive before August 2. Although air capacity to Rio from the US and Canada has tailed off in 2016, additional seats are scheduled for the Olympics from Miami, New York, Houston and Atlanta in the US, as well as Toronto in Canada. There’s also increased capacity for the Games from four European airports with direct connections to Rio – Frankfurt, Paris, Lisbon and London. Travel to Rio has been further boosted by the Emirates aircraft upgrade from Dubai as well a new flight from Casablanca. Total international air capacity to Rio for the Games is up 19% compared with the same period last year, with Latin America up 31%, Europe up 11% and the US and Canada up 9%. While forward bookings for the Games are strong, the post-Olympic period looks gloomier, down 13% for the same weeks in 2015. The biggest falls are from the US and Canada at -50%, Europe -24% and Asia Pacific -14%. The picture is brighter within Latin America with forward bookings up 24%, particularly from Argentina and Chile.